Try this tapenade recipe for a quick appetizer with the authentic taste of Provence. 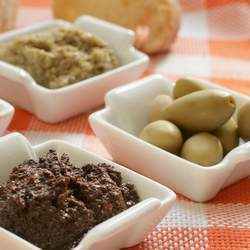 You might be surprised to find out that tapenade gets its name not from the olives it contains but from capers, an essential ingredient in many tapenades. In the Occitan region in the south of France, the word for capers is tapéno, hence the name for this popular spread. For even more French flavor, serve this along with another easy Provençal appetizer spread: Eggplant Caviar. Some sort of olive paste has probably been served for just about as long as people have been eating olives, but the current version of tapenade has been credited to a chef working at the Maison Dorée in Marseille about 100 years ago. It was he who mixed olives with capers and hit upon the current name for this mixture. This tapenade recipe is often times served with lightly toasted rounds of baguette, but you can try it with your favorite cracker or with raw vegetables (try carrots, cucumbers, black radish, and endive. My one warning to you though is to watch your teeth! If you are like me, you could find yourself with bits of black tapenade garnishing your pearly whites. Although you can easily make your own by following the tapenade recipe here, tapenade is one of those food products that are usually pretty darn good if you buy them ready made. As always look at the ingredients, which of course should be mostly olives. It shouldn't take a whole lot of different things to make a quality tapenade. If you want to get an authentic feel for making this tapenade recipe, you can try blending it with a mortar and pestle. This is the traditional method, but I personally recommend the speed and ease of a food processor. Place olives, capers, anchovies and crushed garlic in a food processor and process until smooth. With the food processor on, pour in the olive oil in a steady stream to form a smooth paste. Stir in the lemon juice and season to taste with pepper. If you place the tapenade in a sterile jar and cover it with a thin layer of olive oil, you can keep it in the refrigerator for up to two weeks. Return to Easy French Appetizer Recipes. Although the French do tend to eat tapenade as an appetizer, especially on hot summer evenings listening to the cicadas singing, you will also find it as an ingredient in recipes. Cut out rounds of puff pastry, spread with tapenade and then top and seal with another round of pastry. Bake and serve hot. Try tapenade in this leek tart recipe - a satisfying and unusual appetizer that combines tapenade with leeks and goat cheese. Spread it on thin chicken breasts, roll them up, cover in aluminum foil and bake. You can serve this chilled, sliced in roulades with a green salad and tomatoes. It makes a delicious accompaniment to grilled fish. Try it in an omelet or with hard boiled eggs.